A flexible heater is a device which can conform to the surface which requires heating. There are many varieties of flexible heaters which include silicone rubber heaters, Polyimide Film heaters, heating tapes, heating tapes with thermostats, rope heaters,wrap around tank heaters, gas cylinder heaters and custom sizes. Silicone Flexible Heaters are rugged, reliable, accurate, and moisture and chemical-resistant. They can be easily bonded or adhered to other system parts. Flexible heating elements have a wide range of industrial, commercial, and military applictions where reliability, cost of effectiveness, minimum cross section, resistance to deterioration and basic flexibility are critical. OMEGA Engineering offers a wide range of flexible heaters in Malaysia. 1. How much wattage is required? 2. What voltage will be used? 3. If it is a flat surface, what size will be needed? 4. How long do the heater leads need to be? 5. Will you require a thermostat or a digital controller with sensor? 6. What is maximum temperature? 7. For flat surfaces will require wire wound or etch foil? 8. What is the time required to reach your temperature? 9. What is the ambient temperature? 10. Is insulation being used? Ohm's law shows the relationship between voltage, wattage, amperage, and resistance. It is important to know Ohm's law in order to calculate the load you will be switching with your thermostat or digital controller. For example if you select a flexible heater which is rated 200 Watts and apply 120 Vac, the current will be 1.6 Amps. To determine the kW required to be heat up a solid. The following formula is used. OMEGALUX™ silicone flexible heaters can improve heat transfer and speed warm-ups w here controlled heating is required in confined areas. =All heaters where both the length and the width dimensions exceed 12" (305 mm) use the wire-wound element design. Effect of power density: gentle warming is best done with 2.5 W/in2. A good all purpose unit is the 5 W/in2. Rapid warm-up and high temperature are achieved with the 10 W/in2; however, temperature must be controlled as the safe maximum operating temperature limit of 450°F (232°C) may be exceeded. Polyimide heaters are available in a variety of shapes, sizes, and wattages. Wattage ratings are 2.5, 5, or 10W/in2 at 115 or 28 V. Polyimide Film offers a high degree of resistance to chemicals, and has excellent outgasing properties in high vacuum environments. Typical construction consists of an etched foil element of 0.0005" or 0.0001" thickness which is encapsulated between two layers of 0.002" Polyimide Film and 0.001" FEP adhesive. OMEGALUX™ rope heaters apply heat to tubing with diameters as small as 1/8" (3.2 mm). Featuring a maximum allowable operating temperature of 482°C (900°F), the FGR series rope heaters can be wrapped around either conductive or non-conductive surfaces. Each end terminates with 24" (610 mm) long fiberglass insulated lead wire. These rope heaters are very similar to our heater tapes. Please review our tape heaters for your application needs. 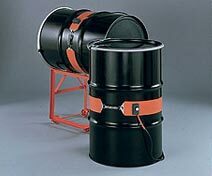 The OMEGA™ TOTE Series tote tank heaters are flexible wraparound surface heaters offered in different sizes based on height. These heaters provide a quick, easy, non-invasive way to warm your product. They fit nearly every standard tote tank utilizing adjustable nylon straps with buckles. There are 3 straps for placing around the tank and 2 for across the top. Units include an adjustable thermostat and a manual reset high-limit thermostat for each of the 2 zones. OMEGA's GCW Series gas cylinder warmers create a convection current and increase pressure inside the cylinder. This cost-effective process reduces condensation, allowing more gas to fill the cylinder. Use with gases such as SF6, propane, nitrogen, oxygen, BCl3, WF6, and HF. There are a variety of temperature controllers and sensors one can use depending on the application. One of the more popular sensor types for flexible heater applications are the surface mount temperature sensors. Thermocouple, RTD or Thermistors are available with an adhesive backing or the ability to be cemented to the surface being heated. There also bolt on and magnetic surface mount type temperature sensors available. Digital temperature controllers come in many different sizes with many output and input choices. Thermcouple and RTD inputs are the most popular with a mechanical relay or dc pulse output. DC pulse ouputs allow the user to go to a larger relay to switch the heater load. Thermostats are also available for the most basic applications.